French anatomist and physiologist, was born at Thoirette (Jura) on the 14th of November 1771. His father, a physician, was his first instructor. He entered the college of Nantua, and afterwards studied at Lyons. 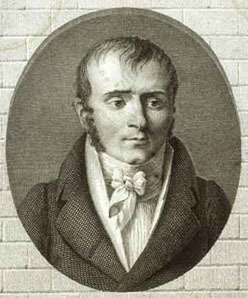 In mathematics and the physical sciences he made rapid progress, but ultimately devoted himself to the study of anatomy and surgery, under the guidance of M. A. Petit (1766-1811), chief surgeon to the Hôtel Dieu at Lyons. The revolutionary disturbances compelled him to fly from Lyons and take refuge in Paris in 1793. He there became a pupil of Pierre-Joseph Desault, who was so strongly impressed with his genius that he took him into his house and treated him as his adopted son. For two years he actively participated in all the labors of Desault, prosecuting at the same time his own researches in anatomy and physiology. The sudden death of Desault in 1795 was a severe blow to Bichat. His first care was to acquit himself of the obligations he owed his benefactor, by contributing to the support of his widow and her son, and by conducting to a close the fourth volume of Desault's Journal de Chirurgie, to which he added a biographical memoir of its author. His next object was to reunite and digest in one body the surgical doctrines which Desault had published in various periodical works. Of these he composed Oeuvres chirurgicales de Desault, ou tableau de sa doctrine, et de sa pratique dans le traitement des maladies externes (1798-99), a work in which, although he professes only to set forth the ideas of another, he develops them with the clearness of one who is a master of the subject. In 1797 he began a course of anatomical demonstrations, and his success encouraged him to extend the plan of his lectures, and boldly to announce a course of operative surgery. In the following year, 1798, he gave in addition a separate course of physiology. A dangerous attack of haemoptysis interrupted his labors for a time; but the danger was no sooner past than he plunged into new engagements with the same ardor as before. He had now scope in his physiological lectures for a fuller exposition of his original views on the animal economy, which excited much attention in the medical schools at Paris. Sketches of these doctrines were given by him in three papers contained in the Memoirs of the Société Médicale d'Émulation, which he founded in 1796, and they were afterwards more fully developed in his Traité sur les membranes (1800). His next publication was the Recherches physiologiques sur la vie et sur la mort (1800), and it was quickly followed by his Anatomie générale (1801), the work which contains the fruits of his most profound and original researches. He began another work, under the title Anatomie descriptive (1801-03), in which the organs were arranged according to his peculiar classification of their functions, but lived to publish only the first two volumes. It was completed on the same plan by his pupils, M. F. R. Buisson (1776-1805) and P. J. Roux (1780-1854). Before Bichat had attained the age of 28 he was appointed physician to the Hôtel Dieu, a situation which opened an immense field to his ardent spirit of inquiry. In the investigation of diseases he pursued the same method of observation and experiment which had characterized his researches in physiology. He learned their history by studying them at the bedside of his patients, and by accurate dissection of their bodies after death. He engaged in a series of examinations, with a view to ascertain the changes induced in the various organs by disease, and in less than six months he had opened above six hundred bodies. He was anxious also to determine with more precision than had been attempted before, the effects of remedial agents, and instituted with this view a series of direct experiments which yielded a vast store of valuable material. Towards the end of his life he was also engaged on a new classification of diseases. A fall from a staircase at the Hôtel Dieu resulted in a fever, and, exhausted by his excessive labors and by constantly breathing the tainted air of the dissecting room, he died on the 22nd of July 1802. His bust, together with that of Desault, was placed in the Hôtel Dieu by order of Napoleon.